Original interview from Decoy issue 3, released December 2011. Having been a major fan of Richard�s work for years, I knew right from the beginning that I wanted him to be the centrefold illustrator for this issue, and I would have been happy no matter what he contributed or how he featured. For those not in the know (and you really should be) Richard has been one of the most prolific and consistent fashion illustrators to come from Britain in the last twenty years, and in this year alone he was commissioned to create original Bodymap illustrations for the V&A�s permanent collection, exclusive works for F.I.G (the Fashion Illustration Gallery) and a 10 page perfume editorial for Commons&Sense magazine, amongst others. 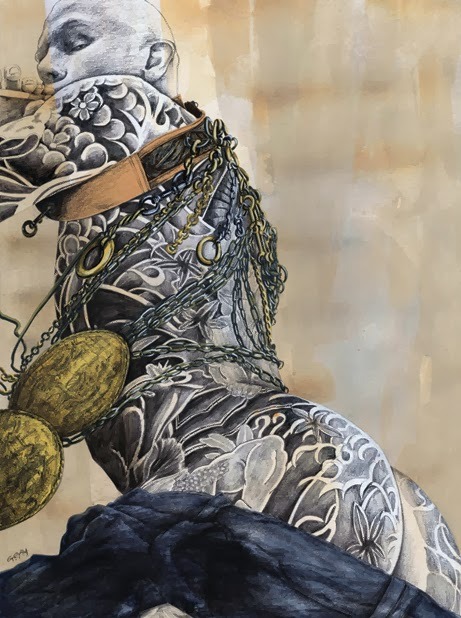 I knew I also wanted a feature on Keko Hainswheeler�s incredible work in the issue. 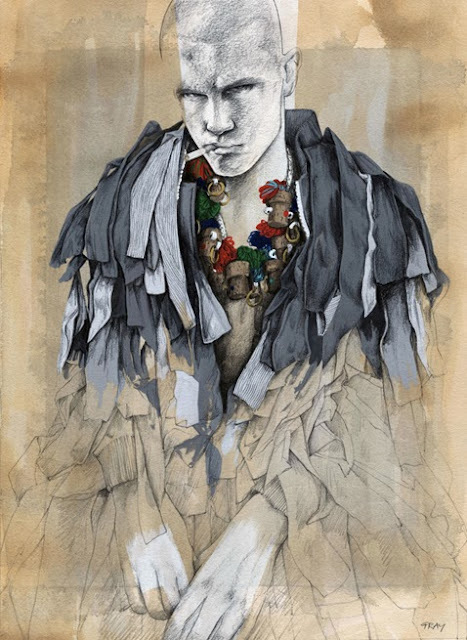 His accessories involve colossal feather constructions, hundreds of gold spikes, fetishistic harnesses, masks and dramatic headwear, and constantly feature in the editorials of Dazed, Vman, Another Man, Vogue Hommes Japan, and adorn the bodies of powerful music icons including Lady Gaga and Skunk Anansie. A big fan of outrageous fashion and a good hairy rudeboy or two, Keko naturally loved the idea of Gray interpreting his work. Tell us about yourself prior to the Antonio Lopez competition that got you discovered by Anna Piaggi. This is where the information on you always tends to begin on you when researching! What was your creative work like at the time and what was that period of your life like for you in terms of growing up and moving to London? in Norfolk. Me and my best friend were always coming down to London, specifically to go to buy clothes in Worlds End, (Pirates, Savage, Buffalo, Witches era especially). It was an incredibly exciting time. In the very early 80�s, around 1981, I think, I saw a photo of Jordan (Pamela Rooke) dressed in Worlds End Pirate clothes, in an amazing squiggle top and pirate hat, in a magazine called New Sounds New Styles. I thought she was the most beautiful and exotic person I had ever seen, and the shop looked incredible, unbelievably exhilarating. So I HAD to come to London and find out what it was all about, and it was through Vivienne�s clothes that I found my love of fashion, but also the sense of research, of creating your own universe, and a sense of narrative. That made a really fundamental impact on me, but at that time, of course my own illustration work was still just being done for pleasure. I drew (and drew and drew) for the pleasure of it. It was what I liked to do most, but I had no idea you could become an illustrator, until I got to Great Yarmouth Art College in the mid 80�s, and I just enjoyed being at Art College and trying all the different creative challenges, and from there came to London, to study fashion design at Middlesex University (then Polytechnic). What was the whole experience like of illustrating from the Couture shows and how did that come about? It�s such a rarified and privileged position, even more so now for an illustrator! I was introduced to Marion Hume, who was then Fashion Editor of the Independent, by Tony Glenville. Marion asked me to go to the Couture shows with her, which was a dream come true. She�s one of the really important people for me, like Anna Piaggi, who have always been so kind and supportive of my work. Marion is a totally brilliant writer and editor, who really pushed me to get the best out of my work. When I was first asked to draw at the Couture shows it was a really interesting time. The first couple of seasons were in the early 90�s so I saw Couture shows designed by Gianni Versace, the last shows of Hubert de Givenchy, Gianfranco Ferre designing for Christian Dior, amongst the others: YSL, Chanel, Lacroix, Valentino, and then was lucky enough to go to John Galliano�s first and second shows for Givenchy and was working with Alexander McQueen for his first Givenchy show. All the big supermodels were still working the catwalk, but there was this big change happening of these Couture Houses being passed onto new English designers. At that time there was no internet access, and no photography, so you had to quickly sketch every outfit that came down the catwalk in case the editor decided she wanted you to draw it, because there was no other way of getting reference. The first ever Couture show I went to was Versace, where, if I remember correctly, for this show, it seemed like every item, skirt, coat, top, bag shoes, gloves was in a different and very specific print and texture. Several prints per outfit, with, I think, two models sent down the catwalk at once. The roughs would be drawn in the hotel room in Paris that evening, after the shows, and the artwork completed by the time I returned to London. All on a tiny little hotel table and table light, stretching the paper in the bathroom, drying it with the hairdryer, and painting into the early hours of the morning. Because of Marion, I was able to go to the designers studios sometimes either before or after the shows and see fittings and sketch from them or see the clothes close up afterwards. There was an afternoon spent watching Christian Lacroix fit some of his models which was literally breathtaking. The man is such a genius, and it was a real privilege. One of those very special memories, among many, because you really realised the talents not only of the designers, but also of the people who made the clothes, the embroiderers etc. The level of craftsmanship at times was staggering. Very inspiring to see it so close. What kind of models and styles do you find yourself gravitating towards? Is there anyone out there who acts as a kind of muse for you at the moment, be it designer or model? Or just anyone who you find fascinating right now? My models have usually been my friends or people I�ve been introduced to, or spotted, who�ve become friends. They�re people I feel really inspired by, not just because of the way they look, but because they�re people I always perceive as being absolutely sure of who they are, in a really uncompromising way. They�ve always been people I�ve had a gut response to, that I HAVE to draw them, or initially just clicked with them as friends because I found them so interesting. Working with them is always really collaborative and creative, but there�s no distinct typical �look�, I�m inspired by, just the person. You�ve probably been asked this question far too much, but it�s always mentioned that you produced work for the late Lee McQueen. Obviously you�ve worked with numerous incredible talents and people, but his vision and legacy are just insurmountable and obviously it�s still a subject of great pain and loss for everyone who admired him. What were the kind of briefs that you worked on and what was your working relationship with him and the brand? 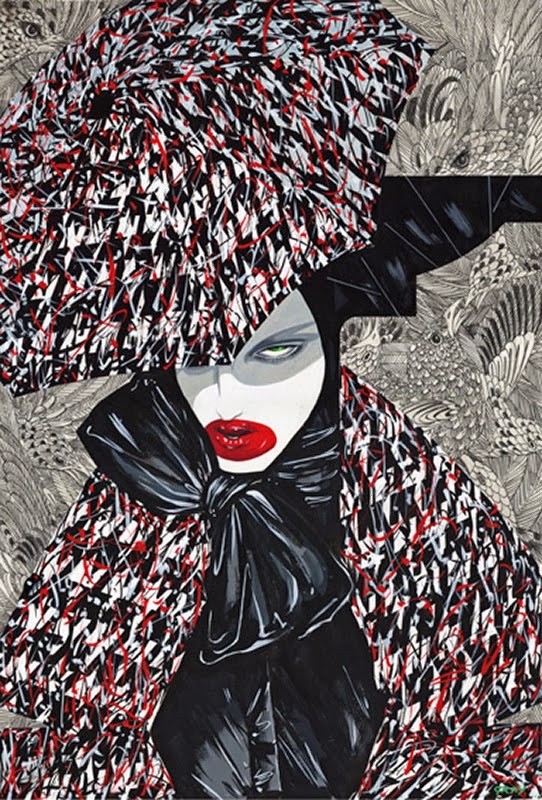 The illustration that you did of Isabella Blow for the tribute show in particular still floors me. Working with Lee was always fantastic. His work was incredible to draw, because it was always so creative and rich in narrative. Really visionary, with total respect for the craft mixed with com- plete fearlessness. He was someone I knew from the very early days. I think he had done about three or four collections, at that point, back in the early 90�s and we had lots of mutual friends, and were often in the same pubs in Soho. I had drawn some of his work for Vogue Italia already, before working with him. For me, he was someone always with such a clear vision, and very decisive over whether something was working for him or not. He asked me to work on some amazing projects for him: to illustrate his designs, enlarged to a wall sized painting for the Fashion at Belsay exhibition, or an illustration for the Black Exhibition, where he held a one off charity catwalk show of his showpieces recreated in black, and held a silent auction of work by designers, photographers, architects, celebrities, to raise money for charity. I created a marketing illustration for the launch of the MyQueen perfume and I illustrated for him while he was at Givenchy, and other in-house smaller projects at McQueen. To be asked to do the illustration for the Isabella Blow tribute show, �La Dame Bleue�, was such an incredible honour, I can�t really put into words how special it was to be asked. It was an enormous privilege. I�ve noticed you�re regularly producing new works for F.I.G, which seems to be a great stage for prolific illustrators and generally for the promotion of fashion illustration. What�s your involvement and experience been like so far? F.I.G. is the creation of William Ling, who has such an expertise and enthusiasm for Fashion Illustration. He has my work for sale at the Gallery and I�ve included some work in group shows. It�s great working with someone who has such a specialist knowledge and passion for the subject, who�s created a specific gallery celebrating fashion illustration. Have you ever considered or been ap- proached about putting a compendium together of your work so far in the form of a book or solo exhibition? I�ve had solo exhibitions in Milan, and have had offers of books of my work. 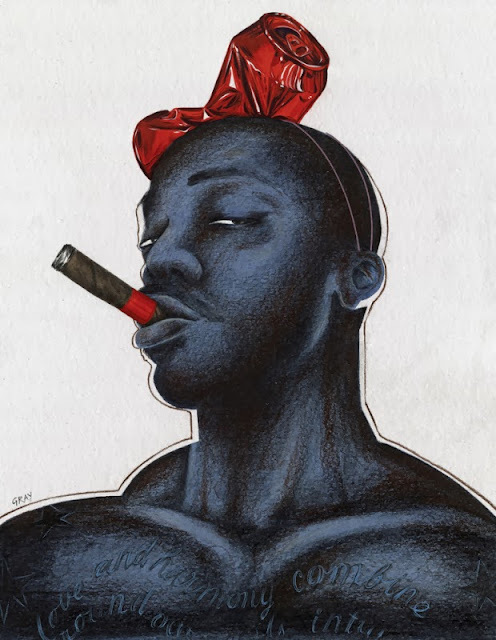 I�m less interested in looking backwards, I�d be more interested in doing a book of my Men, a project of new illustrations, for example, rather than just looking retrospectively. I�d always rather move forward.